ITT exhibited its hygienic valves and twin screw pumps for biopharmaceutical operations at INTERPHEX, which took place last week at the Jacob K. Javits Convention Center in New York City. 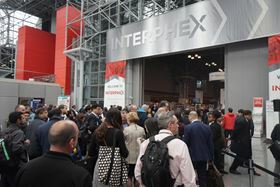 INTERPHEX is the premier pharmaceutical, biotechnology and medical device development and manufacturing event and representatives from ITT’s Engineered Valves and Bornemann brands were available to discuss the company’s products. On show was the Pure-Flo EnviZion valve, which, the company says, introduces a new diaphragm valve platform to the industry, reducing the time and expense associated with the long-term operation and maintenance of these critical process components. ITT also showcased theBournemann SLH-4U, a hygienic twin-screw pump designed for use in a wide range of product viscosities, temperatures and pressures. Dave Loula, Global Product Director for ITT Engineered Valves, said that INTERPHEX is the ideal showcase for the company’s products and that the Pure-Flo EnviZion hygienic diaphragm valve had been selected as a Breakthrough Product of the Year by Processing Magazine. Wanner International has added Hydra-Cell G25 and G35 pumps to its list of models available in 316L stainless steel.